Easypromos provides a complete Prize and Winners Management system that allows you to create the prizes that you want to give away to the users that participate in your promotion as well as configure the way you want to assign the prizes. 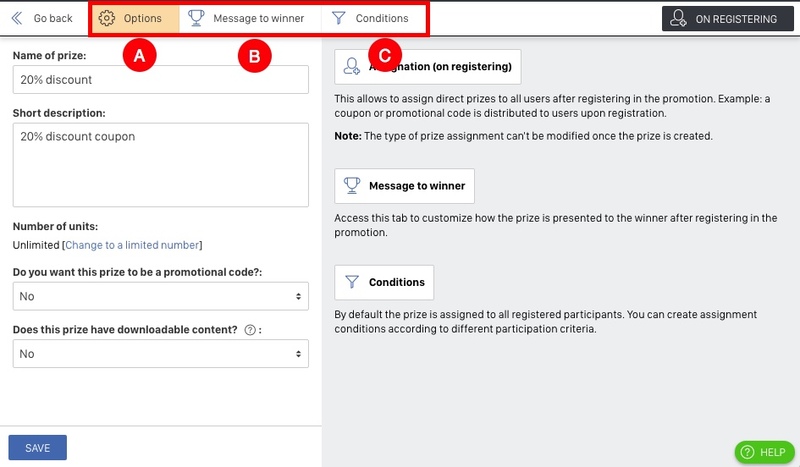 In this tutorial we explain how to create the prizes, how to assign the prizes and that way obtain the winners of your promotion, and finally you will learn how to publish the Winners page that will allow you to show the winners of each prize. A promotion consists of a user participation in order to obtain an incentive. The incentive is the prize of the promotion. Therefore, to be able to select a winner of a promotion, first the prize should be created and defined. 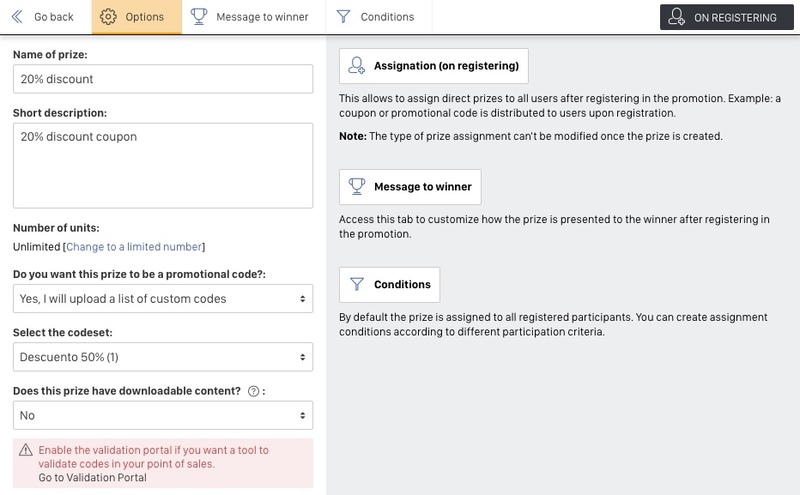 In this tutorial we explain how to create the prize of your promotion, how to show it, how to select the winners and assign the prize and finally, how to publish the winners and communicate with them. By random draw: you can select the prize winners among all the participants or among a segment of participants filtered by a participation criterion. You will get a certificate of validity with the result of the random draw. On registering: you can give direct prizes in the moment a participant signs up, you can for example give a coupon with a unique promotional code upon registration. 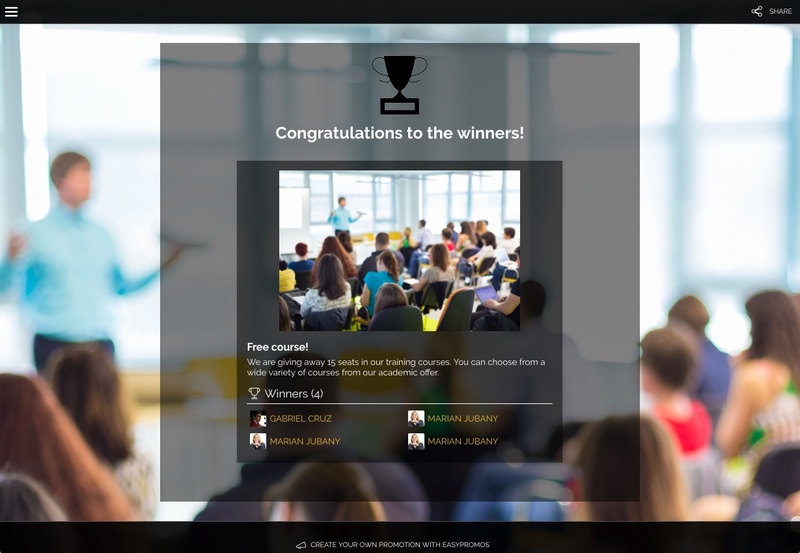 [Only Premium] You will also learn how to give away prizes dependent on participation conditions, for example if the user answers a question correctly or checks the box to receive the newsletter. By Instant win [Only Premium]: you can give prizes directly dependent on the time the participant signs up. By manual assignment: you can assign a prize to a user manually, for example assign a prize to the most voted user or a user selected by a notary. You will also learn to assign prizes as a bulk action, filtering by any criterion of their participation. We’ll divide the process of creating the prize of your promotion in two steps that we’ll explain below. First of all you should create the prize that you’re offering the users that participate in the promoción. Important: In Premium and White Label version you can create all the types of prizes you want. In Basic version you can create one type of prize with the wanted quantity. To be able to create more than one type of prize in Basic version, it’s necessary to have a Basic monthly subscription ($29USD). By random draw: you can select the prize winners among all the participants or among a segment of participants filtered by a participation criterion. On registering: you can give direct prizes in the moment a participant signs up, you can for example give a coupon with a unique promotional code upon registration. Premium and White Label clients can, additionally, create special conditions to assign the prize. By Instant win (only Premium): you can give prizes directly dependent on the time the participant signs up. By manual assignment: you can assign a prize to a user manually, for example assign a prize to the most voted user or a user selected by a notary. Name of prize: This field will be used as internal reference to your prize in the management of the promotion. It will also be the title of prize in the public winners page. Short description: This will appear as the description of the prize in the public winners page. Here you can write the main characteristics of the prize. Units: Indicate how many of this prize you are offering in this promotion. It should be a whole number of maximum 10 digits. In the image above the prize is a Weekend getaway with the characteristics explained in the field: “Short description”. The prize will be assigned by random draw and there will be a total of 15 winners. 6. After clicking the Create button, the prize is created and you will be taken to the page with the list of prizes. Continue with Step 2. Once you have created the prize of the promotion, this will be displayed on the prize list. Click on the pencil icon to edit the properties of the prize you have created. 1. Name of the prize. This is the name you gave the prize when creating it, you can change it now if you want. 2. Short description. this is the description of the prize you defined when creating it, you can change it now if you want. 3. Number of units. This number indicates the number of units you plan to give for this prize. 4. Do you want this prize to be a promotional code? : This option allows you to convert the prize in a promotional code that the users will obtain automatically when participating in the promotion. A promotional code is an alphanumeric code that can be the same for all users or a different one for each user that wins. For the prize to be a promotional code, you should associate the prize to a codeset. A codeset is a set of alphanumeric codes that the administrator of the promotion uploads to the promotion. The prizes use the codesets to know which code to assign and in which order. Additionally, you have the option to choose to show the assigned code together with a barcode or a QR code. Please refer to the Promotional Codes tutorial to know all the possibilities. Try this DEMO to see the user experience of winning a promotional code. 5. Does this prize have downloadable content? : This option allows you to give content that the users can download as a prize. By marking this option, in the winner pop-up the options “Download” and “Send by email” will be added. This content can be a document (PDF, Word, TXT), an audio file or and image file. If you choose this option, you can upload the file that the users can download (max. 10MB), or point to the external source of the file or mark the option that Easypromos should generate a PDF with the characteristics of the prize. If you select this option, in the Basic version it’s a standard PDF that can’t be modified, it includes the image of the prize, the name of the participant and the instructions for use of the coupon, if there are any. In the Premium version you have the possibility to completely customize the PDF where the coupon will be presented, where you can include the unique alphanumeric code, as well as add the following elements: texts, images, rectangles and lines, a QR code validation, and you can customize the distribution of these elements in the PDF through with drag & drop. 6. Option to enable the "Validation Portal". This option allows to validate prizes at the point of sale. In this way, the winners will get the prize which will include a code or even a QR, which will allow the point of sale to insert the code or scan the QR and know right away the associated prize and user data. Check here all the information about how to enable the Validation Portal to validate the prizes at the point of sale. 1. Message to winner: Here you can write a message that the user will see in the pop-up when winning the prize. 2. Image to winner: you can add an image to the message to the winner to make the pop-up more attractive. It can be an image, an animated GIF o even a video. 3. Short description: this is the description of the prize that you defined when you created the prize and you can change it now if you want. 4. Instructions: if you need to add more details about the prize, for example how to redeem the promotional code or for how long it’s valid, you can use this field. 5. Text to encourage winner to share: you can define the text that is presented together with the Share buttons to share the prize. 6. Open pop-up automatically when accessing the Thank you page: when a user wins a prize upon registration, this pop-up can be displayed automatically above the Thank you page. You can disable this pop-up so it doesn’t open automatically. 1. Background image: Upload a background image that will be shown underneath the winner pop-up. It should be 1200x630px. We recommend using an image that makes the winner pop-up stand out. 2. Background color: you can define a background color that will be shown underneath the pop-up and you can configure the opacity of the color. 3. Text alignment: configure how you want to align the elements of the winner pop-up. Finally, in the “Viral content” section you can define the viral messages that will be shown when the winner shares the prize he has won from the winner pop-up to his social media profiles. You can customize the messages that will be shared on Facebook, Twitter and instant message applications. Example 1: Give a unique alphanumeric code as a prize dependent on a dropdown field in the entry form. Example 2: Give a direct prize dependent on correct answers in a quiz. Once you have configured the prize of your promotion, the next step is to prepare the winners page, which will allow you to show publically the prizes that you are going to give away in your promotion, and at the same time it will show the winners of each prize when there are winners. You can decide if you want to publish the prizes page from the beginning of the promotion or you can publish it when you have the winners. 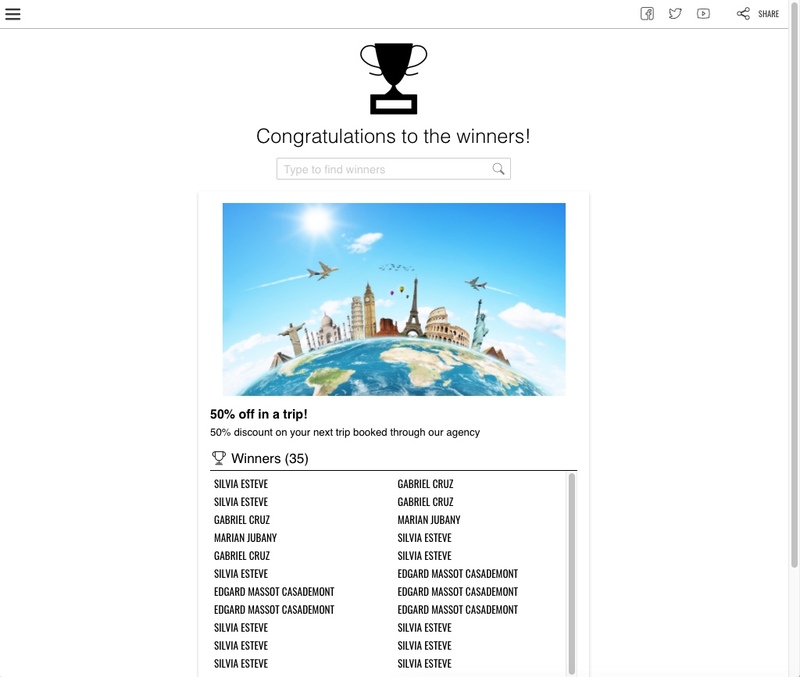 Note: It’s not obligatory to publish the winners page for the prize system to work. You should only publish it if you wish to show the prizes of the promotion with more details. You can control the publication of the page easily with the “Publish page” switch. A. “Publish/Unpublish page”: allows to publish or unpublish the prizes page of the promotion. B. Prizes: here you will find the list of prizes of your promotion, together with the options for editing each one of the prizes and the button to add new prizes. C. Contents: here you will find all the configuration and editing options to customize the contents of the prizes page. You can choose to Show the winners search tool, which we recommend if you have more than 30 winners published. This way, the users can search by name. E. Viral: from here you can define the viral messages that will be shown when users share the prizes page on their social media profiles. Except prizes of the types “On registering” and “By Instant win” where the prizes are assigned automatically upon registration to the participants of the promotion, once the period for participation has ended, it’s time to select the winners and assign the prizes. So if you have created a “By random draw” or “By manual assignment” prize as the administrator of the contest, you should follow some steps to obtain the winners and that way assign the prizes to them. 2. In this section you will see the list of prizes that you have created for your promotion together with the tools to manage them. “Random draw” prizes: From here you can click on the “Run sweepstakes” button to begin the random selection of the winners and that way assign the prizes pending to be assigned through random draw. Follow this tutorial to not miss any of the steps. “On registering” prizes: You can see the number of prizes that have been assigned and look up the name of the winners. “Manual assignment” prizes: From here you can assign the prizes to the winners. Follow this tutorial to not miss any of the steps. “Instant win” prizes: Here you can look up the participants that have won the different scheduled Instant win prizes and it will be updated when there are new winners. A. See the winners that have won each of the prizes. “Run sweepstakes” button to obtain the winners randomly through a draw. “Assign” button to assign the prizes manually. C. Buttons to “Publish” the winners of each prize individually. This action will make the winners show on the public prizes page of the promotion. Winners page. This is the page that show all the prizes and that can be accessed from the main page of the promotion. It also has a URL that can be shared. The prize won has to be public in the winners page. From the Editor of the prizes you can control which prizes are shown on the winners page. Example: In a promotion you can have two different prizes; one big prize to be awarded through sweepstakes among all registered users, and another prize which is a discount coupon to all users that register in the promotion. In this case you might only want to publish the big prize and not the discount coupon. The “show winners” option of the individual prize should be selected. Each prize has the “show winners” option. If it’s selected, the system will publish the winners of each prize in real time when assigned. If it’s not selected, you can publish the description and the characteristics of the prize, but not the winners. These three levels of publishing, allow you to have complete control of when and how the winners of the promotion are published. Next we’ll explain how to manage the state of publication of each one of these three levels. Display of the prize on the winners page. 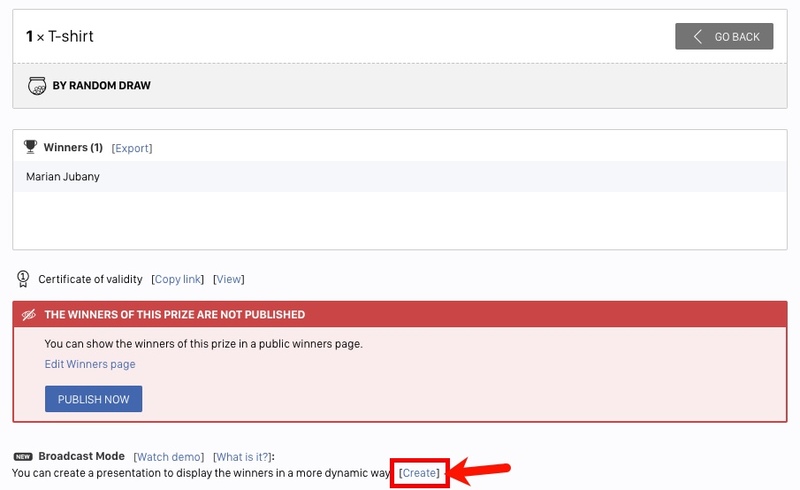 From the section Editor > Pages > Winners you can decide if you want to show/hide the prize and this affects the display of the prize on the public winners page. Displaying the winners within the prize. Among the configuration options of each prize you will find the option: “Do you want to show the winners?”, that allows the winners to be publish automatically and shown in the public winners page. 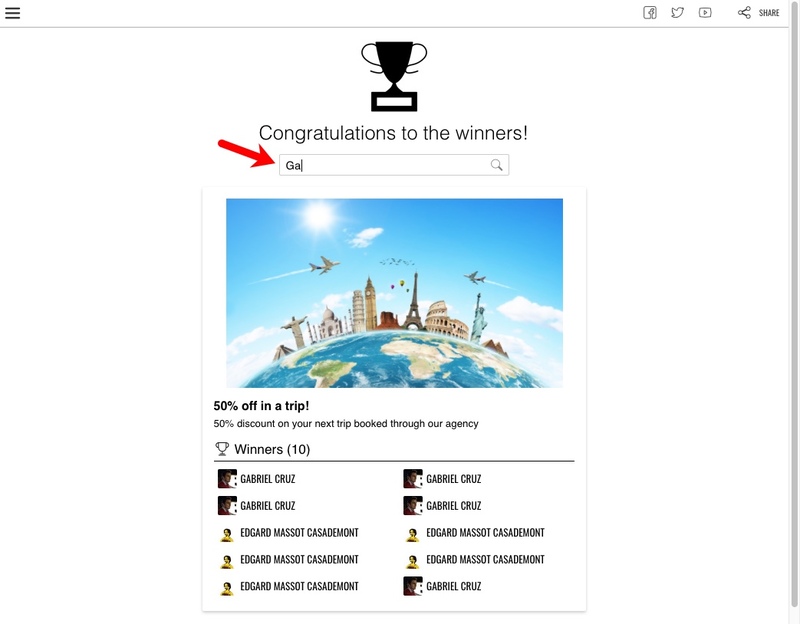 By default, when the "winners page" of a promotion is published, it displays all the prizes of the promotion, as long as the prizes are configured as visible on the page. However, there can be cases in which it may be interesting to have an individual link to share the winners of each prize separately. To solve these cases, you have the possibility to obtain a unique and different link for each of the prizes created in the promotion. In this way, you can share and communicate the winners of each prize separately. In promotions that have a high amount of winning users, you have the option to enable the winners search tool in the winners. This option is recommended when you have more than 30 winners in one promotion. Example: You run a sweepstakes with 5,000 winners that you assign a unique alphanumeric code. Below we explain some ideas to how to communicate with the winners to be able to ease the prize fulfillment management once you have the winners of your promotion. When you have the list of the winners, we recommend to always share the result of the sweepstakes with the participants because, apart from contacting the winners individually, it’s good practice to inform publically to the rest of the participants so that all know who the lucky winners are. You can share this link on all of your social media channels and when users click on it, they are taken directly to the winners page where they can see or look up the name of the winner of the promotion. Once the promotion has ended, and if you ask for the email address in order to enter the promotion, a good practice is to send an email to all participants informing that the winners have now been found and include the link to the prizes page to that the users can visit the page and check out the winners. You can take advantage of the occasion to thank them for their participation in the promotion. In the content of the email you can insert any characteristic of the prize using the smart tags. You can for example show the name of the prize the user has won, if the prize is a promotional code you can add the code and you can also customize the email with the name of the user. Check out here the most common emails that you can create and automate in the Email platform. Note: The Email platform is not included by default in promotions created in Basic version. It can be added to the promotion as an extension for $50USD. 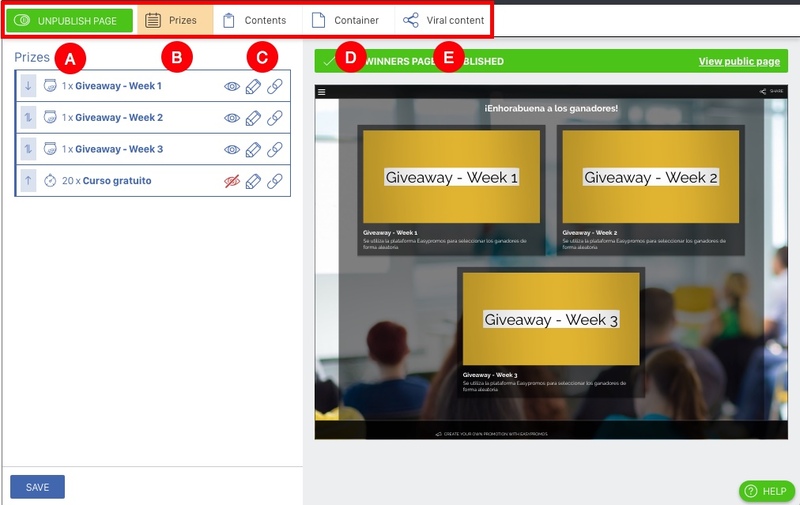 The "Broadcast Mode" functionality allows you to present the result of a giveaway in a dynamic format to make the announcement of the winners more entertaining and add surprise and fun to your giveaways. The platform automatically generates a video when you pick your giveaway winners. The vertical and horizontal video formats are optimized for sharing on social networks, WhatsApp, email, and other digital media. Note: The Broadcast Mode functionality is available for all versions of the platform (Basic, Premium and White Label). 2. Then, a window will open with all the options to customize the presentation. Check this tutorial to know all the configuration options you have available. 3. Finally, check out this tutorial to learn our recommendations to share the presentation with your users and communicate the result of the draw in a more dynamic and fun way.